Voice phone calls are customized, so that users can hear each alarm described in detail and in their own voice. 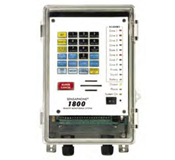 The 1800 is perfect for ultra-low freezer monitoring all the way down to -85° C. Also built into the 1800 is a system that identifies who responds to any alarm phone call, and tracks respondents with a history log. The 1800 includes an output relay so that a local device can be switched on when an alarm occurs, as well as a line-seizure feature. LEDs on the face of the 1800 afford local indication of alarm and status conditions. An additional input type, 4–20mA, not supported in the 1108, is available in the 1800. In addition to the extra channels (8), the 1800 provides a few more unique features, not available in the 1104, 1108, or 1400. The 1800 not only makes voice phone calls, but can send text messages to cell phones and alphanumeric pagers. The 1800 can even upload status and history information. 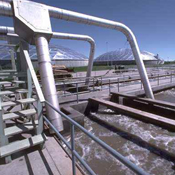 The Model 1800 is ideal for monitoring water treatment facilities and agricultural environments.